I hope that this blog will bring all of use closer together;families, friends near and far. We welcome comments from all of you. We live in the middle of the Pacific Oean on the island of Saipan. 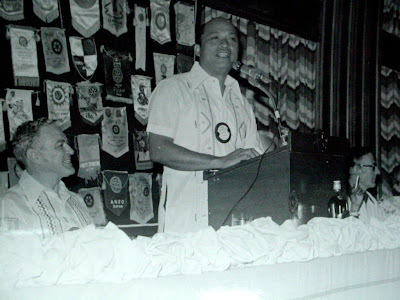 Saipan is the newest political family of the United States of America. I am from the island of Saipan, a U.S. Commonwealth. I work for Century Insurance Company as President/CEO. I'm 79 yeas old born on April 2, 2012. I wrote a book and the title is "A DEGREE OF SUCCESS THROUGH CURIOSITY" It is available at the Joeten Store in Susupe, Saipan. It is also available on AMAZON. 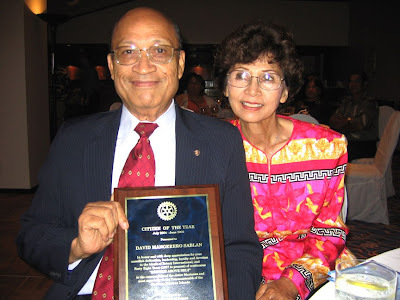 Rotary Club of Saipan-Founder President Dave S.
2005 Rotary Citizen of the Year Award recipient, David M. Sablan and his wife Rita.